It has been a great weekend of old friends, writing friends, and work friends. One event after another for the past four days. And that Viking game. Whoa. It's all good and I'm not even totally drained yet, so I'm not sure what's up with that. But I wanted to post anyway with something I think is about the coolest thing going. I put together something called a Story Map. It is a geeky GIS thing, but I am so happy with the way it's turned out. What it does is combines my writing with GIS (Geographic Information Systems) and puts both into a fun little application called a Story Map. It is essentially that - a map with a story to it. Or, in this case, a story with a map to it. I plan to put it on my website and, more importantly, enter it into a contest at the statewide GIS conference coming up in a couple of months. Note: I built this with a free ESRI account totally on my own personal time. These things can be made for parks and any other number of things at work, but I thought it would be cool to do it for something personal. 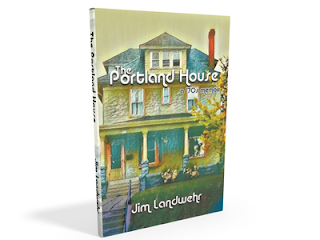 It is my hope that it builds some interest for the book (as well as maybe an award at the conference, but I digress) but more importantly, it gives readers some context for the story of The Portland House. I have a friend who did a similar thing using Google Maps for her book Paddle for a Purpose. It is very cool too! So, here is the link. Please take a look and let me know what you think either via Facebook, Blog comments or in person.